What is a Millennial and does Jimmy belong? Anarchy is waiting in line at the movies. Anarchy is dinner with your family. 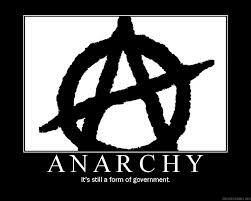 Anarchy is how people solve problems when the threat of force is removed from the equation. Most of us navigate these regular occurrences without need to as some authority figure for permission or assistance. Someone cuts in line? We figure it out. 2 working parents? We figure it out. We figure out many areas of life just fine without laws and the threat of force. People as silly questions like “who will build the roads?” Who sets up the stanchions at the movie theater ticket window? The movie theater. Scale that up. The people who stand to benefit most from a given venture will tend to invest in that venture. Roads would be better because folks would only invest in roads that they care about not which developer wrote the biggest check to which politician.